If you follow my Instagram, you’d know that I have a barking barfing fur-child to attend to (yes, still). So I’m quickly leaving you this recipe, which is a fantastic way to use up any day-old breads, or any over-proofed-thus-deflated breads in my case, which happens a lot these days. 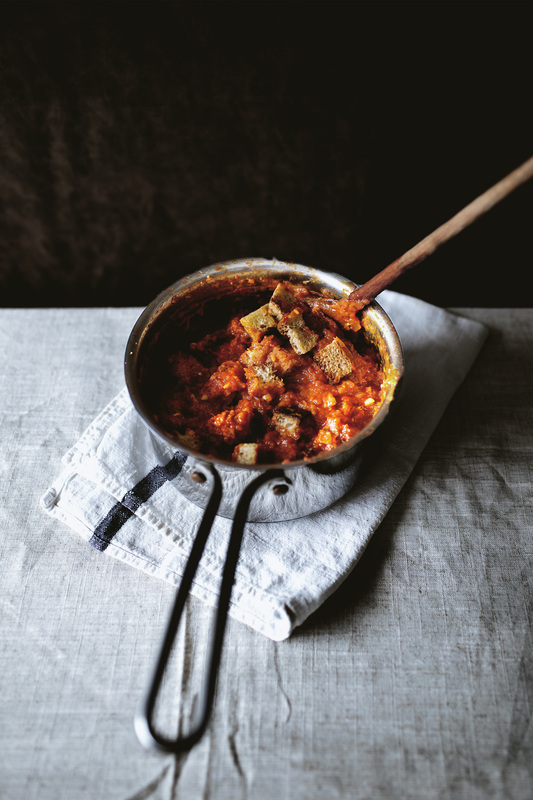 It’s a hybrid between pappa al pomodoro, the classic Tuscany bread soup, and kimchi jjigae, the national anthemic stew from Korea. You can serve it hot with the AC blasting, or chilled and cold at the next rooftop party ya’ll kids are so good at throwing nowadays. Relaxed, soothing and comforting, unlike my life as we speak. So go now. Have some fun for me. Preheat the oven on top-broiler on high. Scatter the cubed breads on a baking sheet, and drizzle with extra virgin olive oil to lightly coat. Place the baking sheet on the mid-upper level and toast the breads, turning a couple times, until crispy and browned on the edges. Set aside. 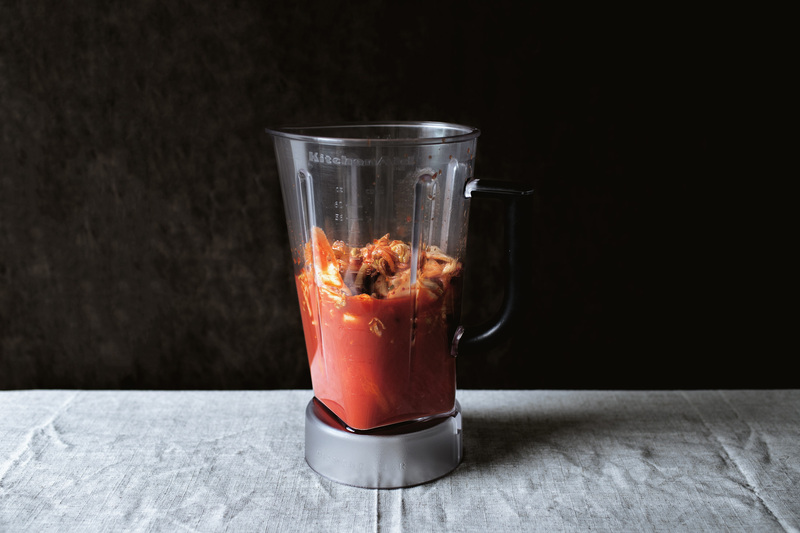 With a blender or immersion blender, blend the tomatoes and kimchi together until coarsely pureed. In a soup pot over medium-high heat, cook bacon fat, toasted sesame oil, shallots, garlics and ginger until they start to brown slightly on the edges. Add the gochujang paste and cook for another min, until slightly caramelized. 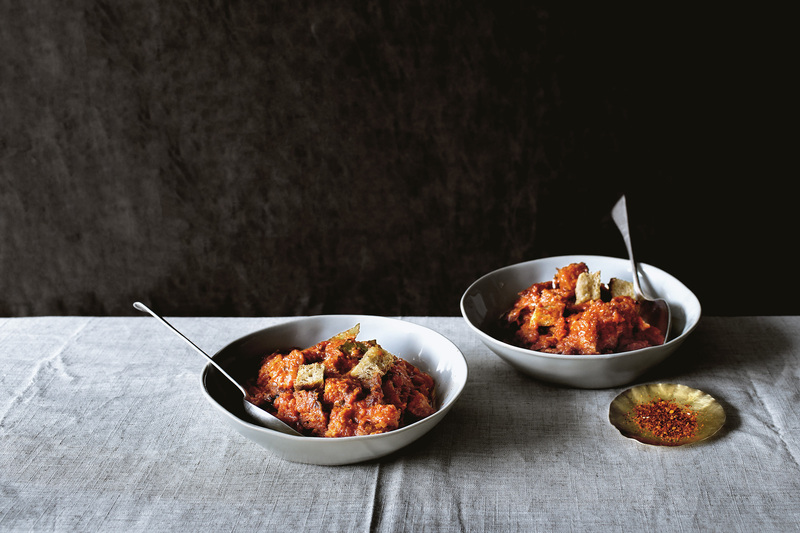 Add the tomato-kimchi mixture, fresh bay leaves and black pepper, and once it comes back to a simmer, partially cover the pot (it splatters) and cook for 10 minutes, stirring once in between. Keep in mind that we need the liquid to soak up the breads, so do not reduce it down too much. I cooked my tomato mixture for 20 min and as you can see it's bit too chunky. Season with red wine vinegar, fish sauce and light brown sugar to taste. 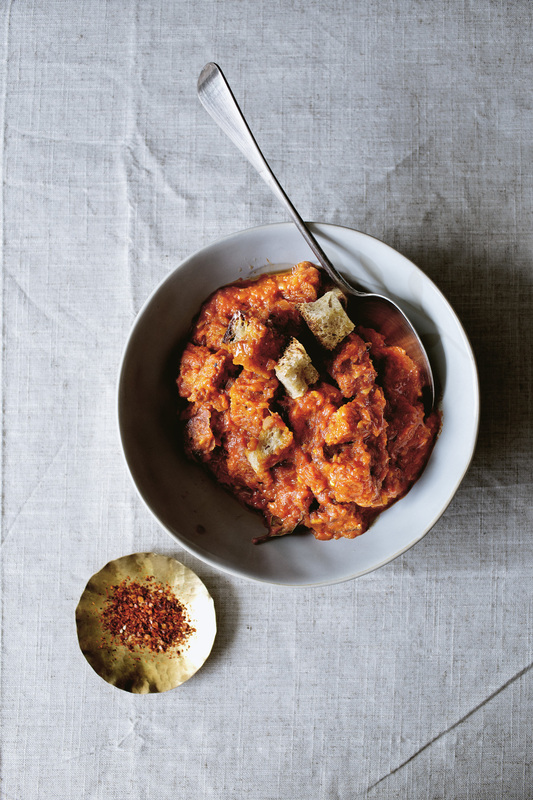 This will largely depend on the kimchi you used. I added about 2 tsp vinegar, 1 tsp fish sauce and 1/2 tsp sugar. If you want to serve it hot, you can prepare the dish up to this step, then finish the following steps before serving. If you want to serve cold, keep going. Now add the toasted cubed bread and cook for a couple minutes, until the breads are softened but not yet mushy. Reseason again with red wine vinegar, fish sauce and light brown sugar if needed. Serve hot, or chill in the fridge for at least 6 hours until cold. Drizzle with more toasted sesame oil to serve. Sending lots of love from California! I think I found a reason to experiment a little next week in the kitchen! I love pappa al pomodoro! What a creative take! This looks so. good. And with such simple ingredients! is it okay if i change the red wine vinegar to apple vinegar? thanks. Woo this is flavoursome!!! 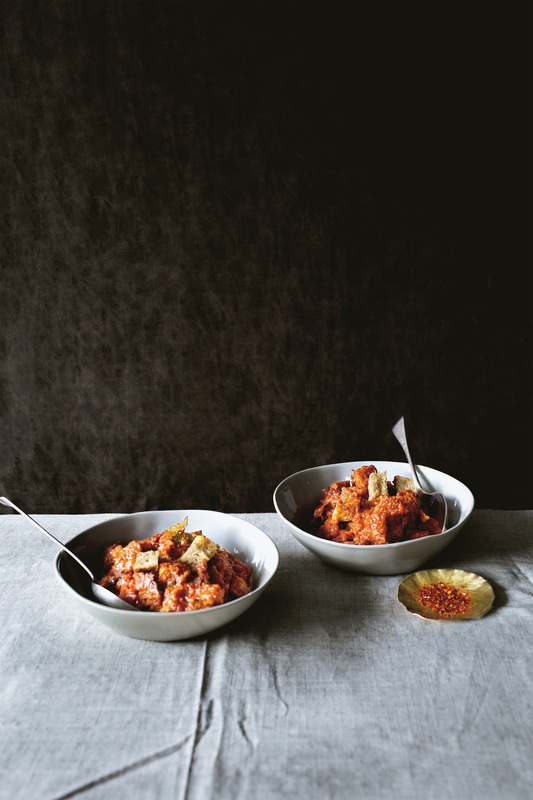 The kind of flavour that whacks you in the face and makes you feel alive – I loved it.